The entrance to the balcony or terrace has been extended with glass from floor to ceiling. This allows lots of light to enter the interior. The white decor has been continued throughout the home and the simple symmetry of the design makes for a stylish interior. 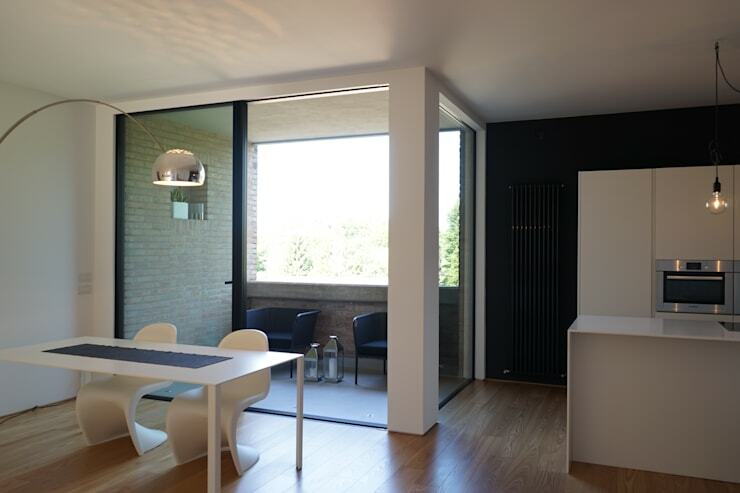 Although this terrace/window is the only light source in the main living area, it's the defining feature in the home. The white living room has a fresh minimalist ambiance. The light colour palette makes the small room feel large and spacious. Fine black window trims add a touch of elegance. 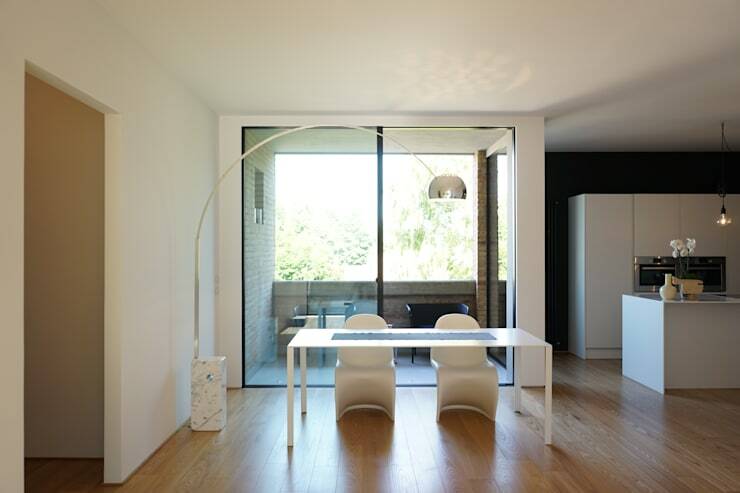 The home also has a central supporting column that has been used to create a zone around the living area. The placement of the white sofa also helps make the room appear more spacious than it actually is. Note the narrow doorway in the far centre that has been designed to reflect the height of the large window. The terrace doesn't protrude from the exterior of the building, so in effect, it gobbles up precious living room space. This is not a choice to be made lightly in a small home, but it really works here because the outdoor space is a very integral part of the indoor life of the home. The glass windows and doors are translucent and left bare so they seem a visual part of the interior. The window construction and supporting beams have also whittled down to an absolute minimum. Even the floor is flush on both sides. In a small home, details like this make all the difference. From this angle we also have a glimpse of the generous kitchen design. The large kitchen island offers lots of preparation space and promises the opportunity for a social approach to cooking. 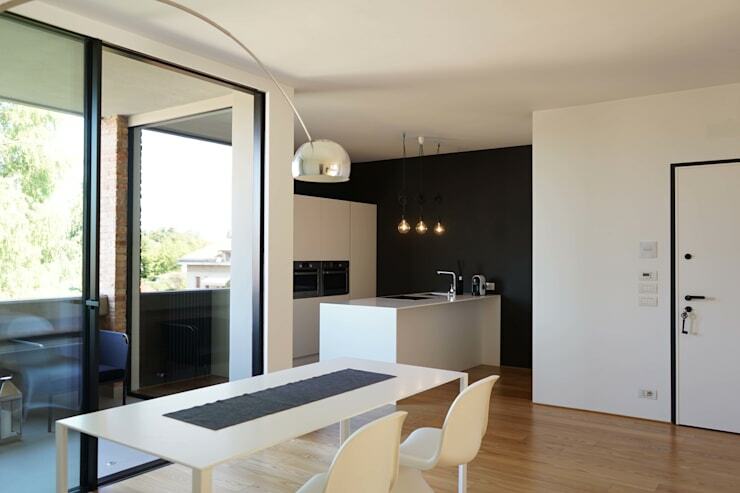 Here we also get a sense of the seamless flow between the kitchen, outdoor space and dining area. 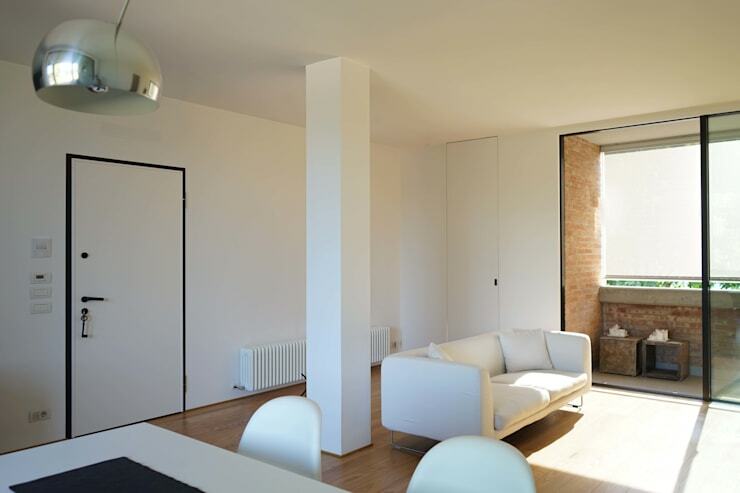 The apartment is located in the larger province of Venice, Italy, so it enjoys lots of good weather throughout spring and summer. The incredibly simple bedroom has a stylish elegance. 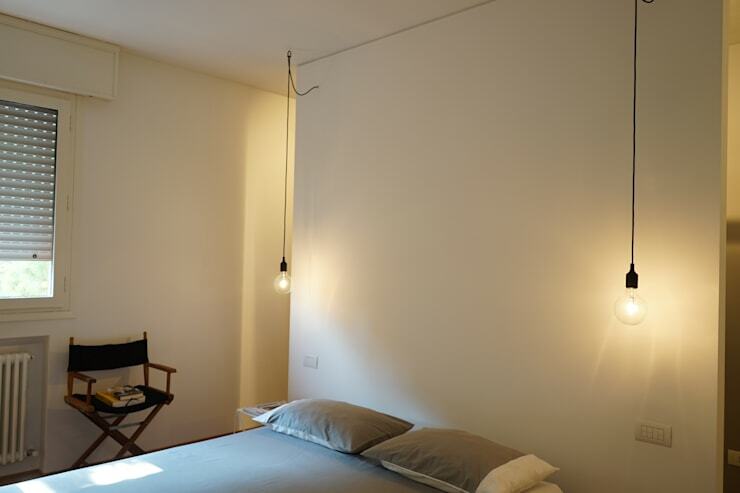 The pendant lights make for one of the simplest bedside treatments we've ever seen. The hanging lights have warm antique style globes that definitely place this within a minimalist context. In a small home it certainly pays to keep things simple. The bathroom is tiny, but it has all the soft comforts of a hotel-style bathroom. Small bathrooms often feel pokey and claustrophobic with the standard old furnishings. 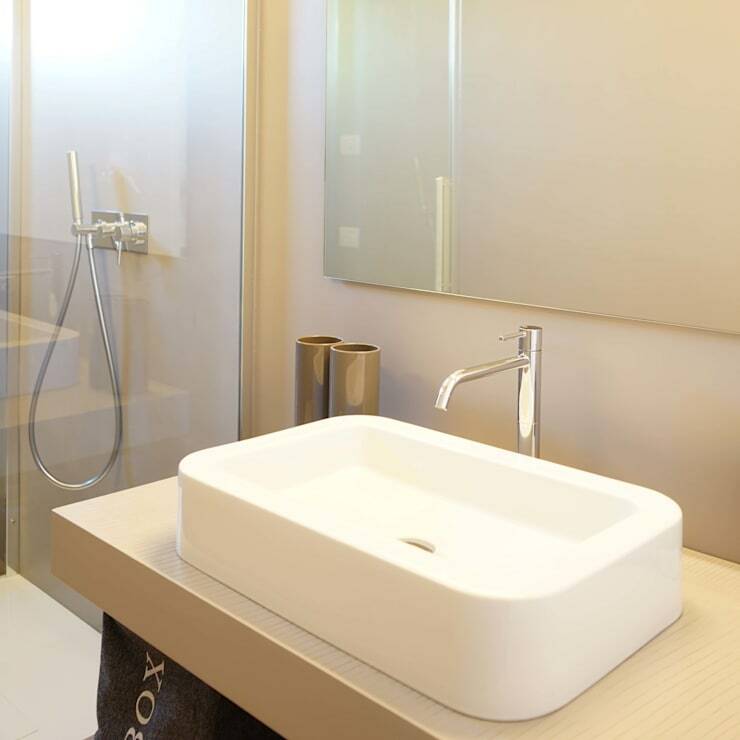 So instead we have a more modern set up with a small, translucent glass shower room and a top-mounted washbasin. Both help create a light, streamlined modern look to the room. The large frameless mirror and soft brown ceramics are the perfect final touch. If you love the neutral colour scheme in this home, have a look at 8 simple steps to make your home gorgeously neutral. What do you think of the outdoor entertaining area in this home?